Nothing is worse than facing time in jail. Sitting behind bars can leave you feeling stressed and worried about what is going on back at home. Perhaps you aren’t the one who has been arrested. Maybe it was your loved one who called you in the middle of the night in need of bail. Either way, when you need help posting bail, you want a team on your side you can trust. Here at Affordable Bail Bonding, we are proud to provide bail services across Virginia. If you are looking for a local bail bondsman in Halifax, we invite you to reach out. Check out the following six reasons why we are the perfect team for your needs. One of the number one reasons people contact a bail bondsman is because they can’t afford bail. Judges often set the bail amount at too high of an amount for the average person to pay. This is where a bail bondsman can help. You simply pay us a percentage of the total bail amount and we post the rest on your behalf. Can’t afford the fee? Talk to us about our financing options. Arrests rarely happen at a convenient time. We get that, which is why we are on call 24 hours, seven days a week. There is no wrong time to contact our team. The sooner you call, the sooner we can get to work. You want to get out of jail and you want to get out fast. We work efficiently, navigating the justice system to post your bail as quickly as we can. From the moment you first call us to the second you a released, we will be doing everything within our power to make the process fast. You are already facing enough stress as it is. The last thing you want is for a bail bondsman who treats you unkindly. We always provide respectful service. It is not our place to judge but rather to help. When you choose Affordable Bail Bonding, you are choosing a trusted team. We have years of experience and a proven track record in the local community. Check out our reviews to see for yourself what people are saying about our bondsmen. Trying to figure out how to post bail, how to get yourself or your loved one out of jail, and what steps you need to take next can feel extremely overwhelming. 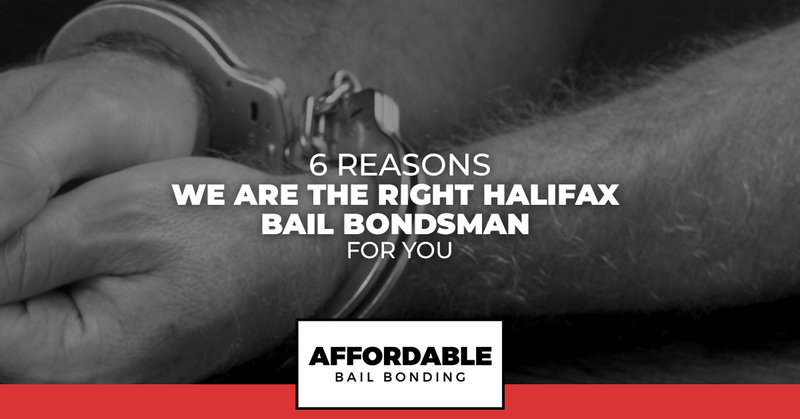 When you choose a Halifax bail bondsman from our team, you get the benefit of experience with the local jail system. We know how to navigate the paperwork and necessary steps with ease. Looking for help posting bail in Halifax? Please contact our team right away. We will get to work helping you secure you or your loved one’s freedom as fast as possible.